I made a lovely dinner a few nights ago after dance. I had extra ricotta cheese from our big shells recipe and after a quick search I found this Lemony Ricotta Pasta (from The Kitchn). Groovy Girl loved it. She is working on eating less cheese/dairy and certain items seemed to trigger more. Ricotta cheese doesn't seem to be a problem. Pizza, though, huge problem much to her huge dismay! I had to laugh today as I discovered this post from long ago (2014) as I searched for a pie crust recipe for my mother. Good to know we like what we like!! Do take a moment to click back; it's worth it. This was not a stellar reading month for me. Only two books. I did watch all of Season 1 and 2 of The 100, a dystopian drama series. I highly recommend it but it did get in the way of my reading. 1. Piecing me together by Renee Watson (2017)- What a gorgeous cover that is. I want to know that young woman. Jade struggles with the two worlds she is part of; one with her mother where there are never enough money or groceries at the apartment she shares with her mother and uncle. Jade attends a private high school on a scholarship and she pushes herself to take every opportunity to get ahead. When she is asked to be part of a new Woman to Woman mentor program she starts to see clearly what she wants from her life even as her mentor struggles with her own path. Jade's character is strong with an artistic flair. Renee Watson has a few other books out that I am now interested in. Jade's coming-of-age tale of friendship, survival, finding your own wings should be enjoyed by many. 2. 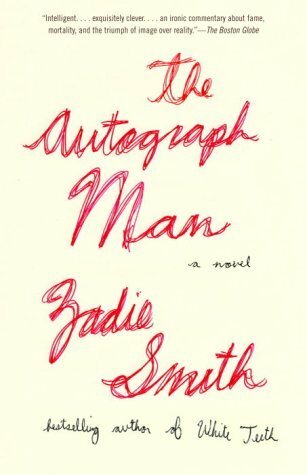 The Autography Man by Zadie Smith (2002)- As I've carried this book around to dance classes, church, coffee shops, and brew pubs over the last few weeks I've had many ask me how I like the book. My answer has been the same; weird. The autograph man is Alex-Li Tandem and he is drifting through life, drugs and alcohol are his entertainment, and his friends are merely bystanders as Alex messes one thing up after another, including his long-term relationship with Ester. On a buying trip to NYC through a chance encounter he meets the woman of his dreams. She's now 70 but he loves her anyway. As he makes plans to bring Kitty Alexander back to England with him, it's unknown whether this will help him recoup the life he's wasted. It's an interesting journey. I like Zadie's writing. I'm just not sure I feel invested in the autograph man's story. I'm really ready for May. And some warmer weather. 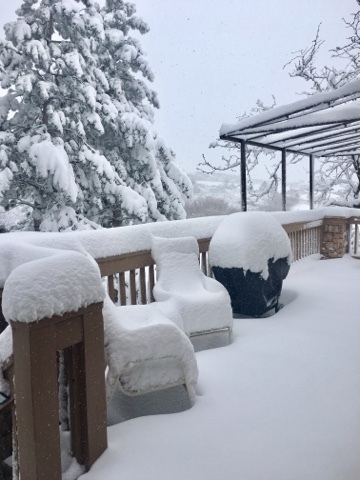 Although after seeing this photo sent to me yesterday by a Colorado relative I'm glad I'm not there. It only feels like winter here. Work is crazy-good-but crazy. I have a new library assistant and it has been amazingly fun to work with her, train her, and watch her work and develop relationships with our students. I have 4 boxes of new books from Follett and several boxes from Scholastic to process and add to the collection. We've had several big school events that our group of leadership ambassadors have been part of and that just takes work from me to organize. It's inspiring to work with them and pushes me in new directions but it's challenging to add that to my already busy library tasks. Home is crazy because dance is on extreme mode as we approach the end of May recital. We have costumes to attend to, tickets, pictures, makeup, pasties to buy. 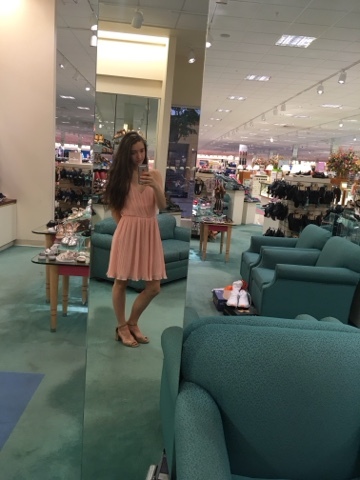 We also shopped for a 9th grade formal dress/shoes and that was a whole fun shopping night. We found beautiful shoes and an on-sale dress that matched and were perfect. Groovy Girl is going with a group of free-spirited girls and a few boys are tagging along with them. One (girl)friend will wear a suit of some sort, another a pair of sparkly Chucks with her dress, a few have dates, but most are just going to be together, dance, and have fun. Home is also crazy because my husband has three different plays going on and is working with 1st graders at a local school. Plus he's building a structure in our backyard to house a special new family pet. This enclosure has been time-consuming but it looks so beautiful. He had to take out our garden plot to build this so this year I will try gardening in the front yard plot plus some containers on the patio. We will soon celebrate Teenage Boy's birthday-he'll be 22 on Friday. No longer a teenage boy anymore but that lives on in my mind. We are celebrating together at an Italian restaurant in Marion. We will come bearing gifts fit for a 22 -year-old college student. 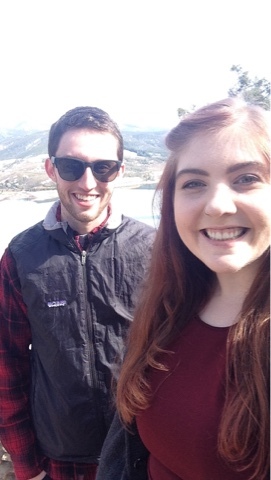 He and his girlfriend took a quick trip, for a family wedding, to one of our favorite states-Colorado. Anton is doing really well and has worked with a local organization that helps at-risk young adults return to school. He's put in an application for Hawkeye Community College. That was a happy day. There is still a long uphill journey to go but at least we started out. Terrible rain storm here tonight, rumbling, with lightning. I enjoyed a walk with friends this afternoon around a large lake and it was cloudy and smelled like rain but lucky for us it held off. It came tonight with lots of rumbling and a light show display. Groovy Girl and I are dog sitting for a friend and I had to bring the dog back here with me. Her sad yellow lab eyes looked at me through the door and I just couldn't leave her alone. So we have a doggie sleep over guest who's had a good time getting to know our house and our two labs. I made one main major meal this week-Stuffed Shells with Arrabbiata Sauce from Giada on Food Network. My brother made it for GG and I a few months ago and we both liked it. It's a little labor intensive though so I made it last Sunday afternoon when I had the time. Throughout the week GG was able to eat the leftovers for dinner before dance. Next time I'd leave out the pancetta; I didn't really enjoy the flavor. While I was looking through some old blog posts I found this Sweet Potato Black Bean burrito recipe that I love. 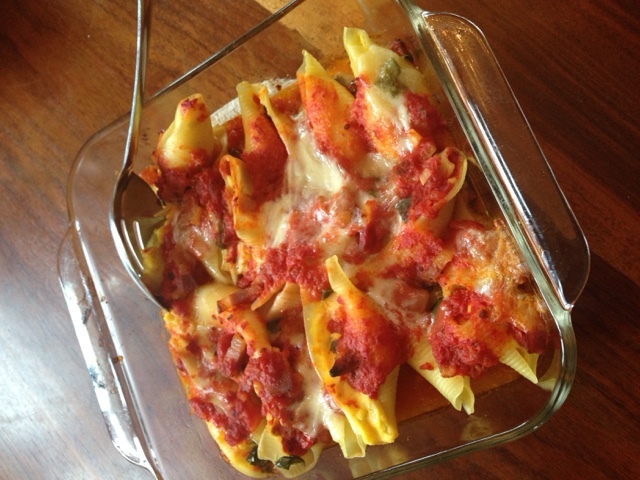 It is perfect to make and keep extras for lunches as well. Also I found this great recipe for breakfast sandwiches that can be made ahead. I'm trying to make Anton one every morning so he leaves for work with something for breakfast. 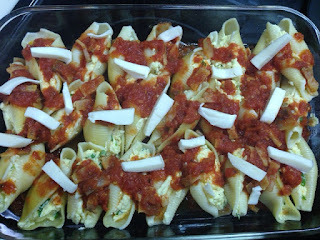 The recipe says you can freeze these; I've just been keeping 3-4 ready to go packaged up in the fridge. It's easy to take one out, heat in the microwave for 20 seconds, and hand it to him before he heads out the door. Tomorrow we celebrate Easter with a church service where Groovy Girl will do a celebratory lyrical dance for about the 4th year and after we head to MN to have dinner cooked by my stepmother. I'm very excited to just sit at her table and enjoy the family around me. Blessing abound. Much of being a parent is really difficult. I've always said the good, the true joy of being a parent, outweighs all the negative that can and often does happen. This applies to my family completely. We've had struggles (key the amen choir) and some times it can be days before true JOY shows it's pretty head. My son turns 22 at the end of this month. Shocking-YES. My stepdaughter turned 25 a few days ago. It's a big birthday month. 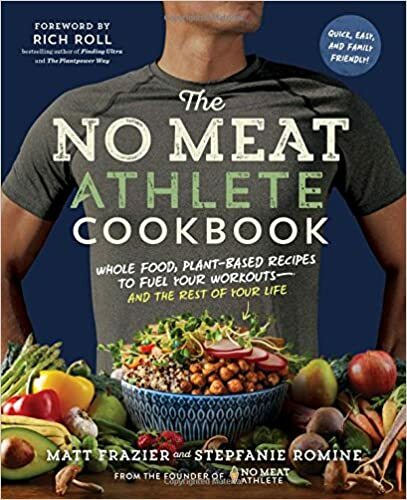 I received my son's birthday wish list yesterday and low and behold (cue the choir again) THIS meatless cookbook is on his list. If any of you reading have been following along for years this is the kid who insisted we put meat on his plate at the end of middle school. He was working out a lot, playing hard, and felt like our mostly plant-based diet was not filling him up. He was sick and tired of being raised vegetarian. This outburst from him prompted me to look into sustainable meat which created a whole new food journey for our family. I started buying meat from local farmers and listened to one of my food heroes Barbara Kingsolver. In Animal, Vegetable, Miracle she says that at one time the only option was to abstain from meat if you were conscientious about your food choices; now there are options so promoting and purchasing farmer-raised meat is good for us and good for the farmer and ultimately good for the environment. So I'm gently patting myself on the back that my son, even though I know he still enjoys meat once in while, is aware of other eating options. Bravo. 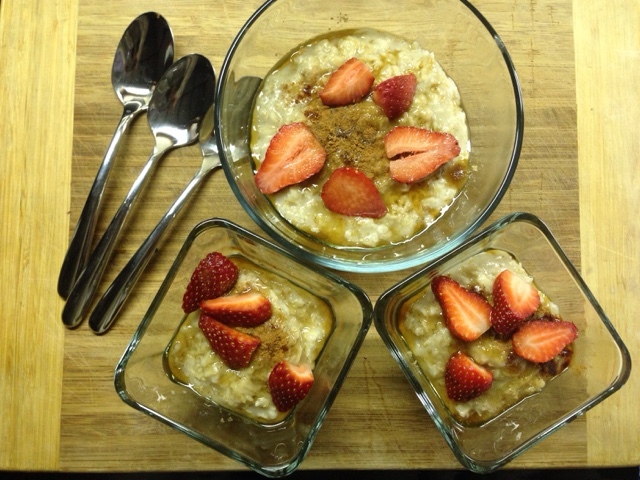 Groovy Girl, who really wishes I could come up with a new blog nickname for her, makes me feel joy often but in particular the other day when her braces-covered-teeth were sore she made the request for me to make my special oatmeal for her breakfast. It was the way she said it like she was 7 again and not 14. I rewarded her with a delicious bowl full and mini ones for my husband and I. Truth be told I don't do anything that special but I do stir it as it cooks which makes it creamy and at the end I add what ever fruit we have and sprinkles of brown sugar and cinnamon. Made with love. Groovy Girl (the name is too perfect and she'll be G.G. 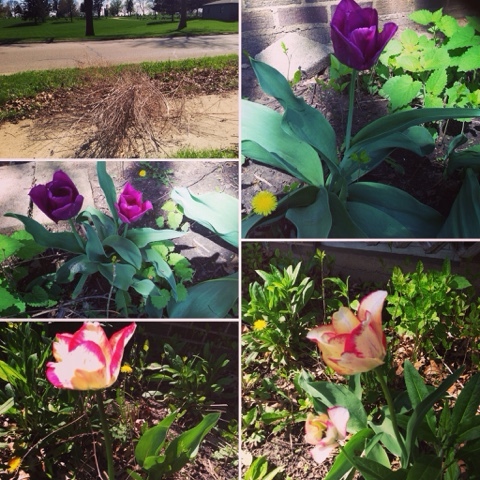 until the day the blog ends-sorry babe) and I did FaceTime with oldest daughter on her birthday and that was a highlight of my week. She had been at the musical Groundhog Day in NYC so we talked to her as she walked to the train. NY looked magical with twinkling lights and all the activity around her. I can't wait to be there this summer with her. Anton, my former student, living with us as an adopted son now is doing really well. He has a job, has his IA driver's license, and has made a friend. Right now he is outside helping Greg with some chores. Teaching him to be part of the family is probably the hardest hurdle as that's not something he's experienced in the same way many of us think about family dynamics; how we work together and communicate. It is a thrill still to have him here. Circling the Sun by Paula McLain: Beryl Markham, a horse trainer and aviator, is raised by her father and the native Africans that live on their land in Kenya during the 1920's. She has difficult love affairs and struggles with life after her father's horse farm fails. The imagery of Africa that McLain paints is beautiful. I like historical fiction and this was well-written. My mother-in-law gave me The Paris Wife a few years ago and I feel inspired to read it after finishing this one for our February book club discussion. The Mothers by Brit Bennett: Bennett tells a captivating story of Nadia Turner; a young high school senior ready to move on with her dreams of going East for college. The summer before her senior year though she is battling loneliness after her mother's recent suicide and she takes comfort in Luke, a damaged former high school football star. An unplanned pregnancy changes how they both move forward into the world. This was very good and I look forward to Bennett's next book. The Hate You Give by Angie Thomas: I loved this one also. Angie Thomas writes a wonderful and timely story of Starr Carter, a basketball-loving, smart young girl attending an expensive prep school outside of her neighborhood. Through Starr we are shown first hand how difficult it is to remain true to yourself as you juggle friends and ideas from both lives. When Starr's childhood best friend is killed by a police officer her two worlds begin to collide. The conversations between Starr, her parents, and extended family remind me of Ta-Nehisi Coates' letter to his son (and to us the white audience) on how hard it is to raise kids knowing their lives don't matter to some. Reviewed here by me. How the Garcia Girls lost their accents by Julia Alvarez: I wanted to like this but ultimately it didn't hold my complete attention. Like the struggles in The Hate You Give, this one shows how hard it was for the Garcia sisters to be both old world for their parents yet navigate in the modern NYC they are raised in. While the four sisters love their Dominican family it is not easy being raised in the mostly sexist/patriarchal society when they have their own ideas of what their lives should look like. Artemis Fowl by Eoin Colfer: I read this for my 6th grade book club and was not that impressed. It had mixed reviews from the 6 kids in the club. One of the students loved it, finished two more in the series by the time the rest of us finished just the one. This is why I love book club; it pushes you to read what you might not otherwise have picked up. This student even admitted "I don't think I would have picked this off the library shelf!" Now that I've read it I know I have other students that I can recommend it to but I know I don't need to read beyond this first one. Maybe it's the political arena right now that made me shudder with many of Artemis' villainous ideas. My March reading greatly improved from February where I got bogged down with that one book, My Brilliant Friend by Elena Ferrante.